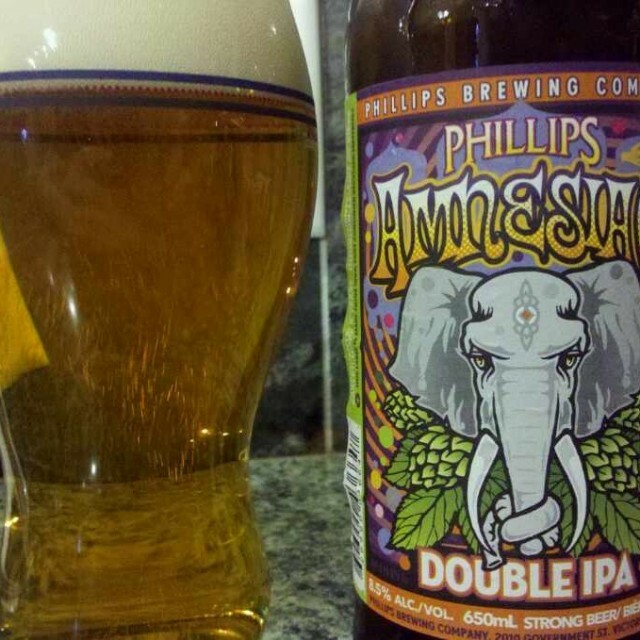 A long time has passed since drinking a Phillips beer. Perhaps it is my pompous beer persona that has stopped me from drinking Victoria's most popular brewery's offerings. 'Perhaps' is not the right word.. 'certainly' seems more appropriate. The Amnesiac caught my eye and spoke to me. After standing in line - behind a guy with an armful of Corona light - I bought my beer and cycled home. How can they brew a Corona light? I hope that guy buys a lime, because he might mistake his beer for bottled water. My current beer selection seems to take a back seat to the two current IPA showdown contenders: Fat Tug and Switchback. These two newcomers have shadowed Amnesiac's trend setting appearance. Certain Victoria beers drinkers have lamented about this Phillips product being hoppier in the past. I think the hoppy measuring stick has just been raised over the years. The nose is like walking through a Christmas tree sales lots; fresh cut pine smells are everywhere. Trees yield to a creamy tingle of resin, tangerines and Five Alive juice. Amnesiac is a frighteningly easy drinking beer for 8.5% ABV. After the sip you are left with a long, and slightly astringent, memory of tangerine marmalade on whole wheat toast. I should make my tasting reviews longer; hiding my thesaurus might help. Before I rate this beer, we need to have a quick discussion. It is about everyone favourite beer friend: dimethyl sulfide (DMS). DMS is the aroma of vegetables, creamed corn or asparagus. This is not to be confused with diacetyl; which is the flavour of butter and adds a slick mouthfeel to your beer. These flavours are permissible in some beer styles, such as German pilsners. From a judging standpoint this is acceptable, but from a drinking standpoint this might be unacceptable. I have this argument with EskimoDave from time to time. He is a DMS hater. Conversely, I am a DMS fan. In the right amounts it adds body and sweet vegetable flavours. EskimoDave thinks it provides grossness in a glass. Now that I think about it, I don't think I have even seen EskimoDave eat a vegetable. A soon as the nose hits the glass, the aroma of creamy vegetables and spices fill the nostrils. A slick and chewy mouthfeel delivers spicy hops and big carbonation up front. This settles down to reveal dry straw,a hint of honey and creamed corn. The nice long finish reminded me of pistachios and limes. Very refreshing, if you like your veggies. This interview almost never happened. I was to met Dean McLeod, Head Brewer at Lighthouse, after work. I arrived first and sat on one side of Swans Pub. Dean arrived later and sat on the other. After twenty minutes my phone chirps. It's Dean:"Ian where are you? I'm thirtsty." Swans in not a very big pub, nor was it particularly busy. The amateur should be easy to pick out at this point. After an apology, from me, we sit down to talk about this new brew: Tasman Ale. The idea for this beer came from fond memories of sampling low alcohol beers available in Australia during the 70's and 80's. Most of them were awful. Dean begins, "I wanted to create a light bodied, sessionable, easy drinking, dry, thirsty quenching beer that has flavour." He looks me in the eye and continues: "This is never going to be a beer bloggers will rave about. It is not the intention of it. It is a beer for home, standing around the BBQ with a bunch of mates." I change the subject and ask Dean about his affinity for southern hemisphere hops. This is a pale ale made exclusively with southern hops that we might not have tasted before: Topaz, Summer Saaz, Motueka and Rakau. "I really in particular like New Zeleand hops because they are all spray free," he explains, "so most of the organic hops in the world come from New Zealand because it is very short leap to go from spray free to organic." North American brewers were first exposed to these hop varieties during the great hop shortage about five years ago because it was all they could get. Dean adds, "then they found out that they were actually really tasty." 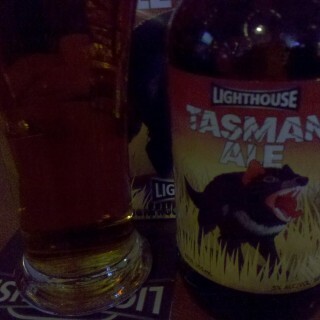 So what did this beer blogger think about the Tasman Ale? I liked it. The use of southern hemisphere hops is very apparent; this is not your usual pale ale. The slight citrus hops are there, along with new flavours of tropical fruit and lime. This is balanced nicely with a soft bready and toasted maltiness. The sip ends clean with only the slightest lingering of sweet bread and mineral hop bitterness. No, this will not be a beer bloggers will rave about. However, if my hand plunges into an ice cold cooler of beer at a BBQ and finds a Tasman Ale, I will be very happy.